Steampunk jewelry is an intriguing style that reworks vintage and salvaged pieces into something newer and wearable. The style reflects a subculture movement, cued by the invention of steam power in the Victorian era and how it moved the world into the industrial age. Elements of time, such as clock parts, feature prominently in the style. Old keys, parts of something mechanical...all may be found in Steampunk. Nothing is shiny, parts may be used and showing some age, metals are darker and non-precious. Our finds here incorporate watch parts and typewriter keys. Assembled by hand, each one is unique and a treasure! Although the name Steampunk implies something edgy...we think this is intrinsically interesting jewelry that is very wearable! Vintage manual typewriter keys, ivory or gold letters on black background, are joined into a simple necklace of love, X-O for Kisses and Hugs. Each key is a little worn (it's old! ), suspended from black suede cord. 18 inches long, lobster clasp, 1 inch extender chain. Pendant is made with metal filigree background and a watch movement on top, with all the interesting metal gears and parts. It does not function of course, it's just plain interesting! 1-3/8 inches long, 1-7/8 inches across. Suspended from 18 inch ball keychain, you can cut the chain if you want shorter. All the intriguing inner workings of a watch, without a face and cover so you can enjoy. This is not a functioning watch. It is attached to a silvertone thin band that has an overlapping split in the back to adjust size 5 and larger. Note that there are little pieces that can catch on fine knits. Top measures 1 x 9/16 inch. Flat metal pieces that have watchface markings, about 5/8 inch wide. Colors are metallic neutral, and these are used so not in pristine shape...you enjoy the history. Each is mounted onto a silvertone metal disk and joined with o-rings, the clasp is a foldover style. 7-1/2 inches long, but it's easy to remove one of the watchface links to shorten (about 1/2 inch per link)! Cupped watchface is riveted onto a background sheet of embossed metal (looks rather copper-ish). Accented below with additional riveted metal parts including a spiral. Parts may not be new, but intriguing from use. Earrings are 1/2 inch across, 2-1/8 inch long on surgical earwire. All the intriguing inner workings of a watch, without a face and cover so you can enjoy. This is not a functioning watch. It is attached to a silvertone thin band that has an overlapping split in the back to adjust size 5 and larger. Note that there are little pieces that can catch on fine knits. Top measures 3/4 x 1/2 inch. Twelve oval-shaped watch movements, solid backing and all the intricate moving parts revealed, are joined by simple links to form a 7-1/2 inch long bracelet, 5/8 inch wide. Primarily silver and brass finishes. Watches do not work, of course, the surfaces are reasonably smooth and flat, but probably not a friend to knit sweaters. 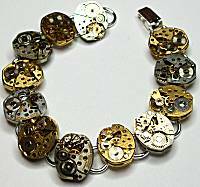 Read about what others think of Steampunk jewelry! Instead of reviews for a specific product, this is a place to share about the designer line in general.